This article from the magazine "Where to Retire" was published in their Fall 2000 issue. Century-old buildings house galleries, shops and offices. Population: 8,200 in the city, about 25,000 in Jefferson County. Location: On Puget Sound in the northeastern corner of Washington state's Olympic Peninsula, about 52 miles by highway and ferry north and west of Seattle. There are views of the Cascade Range to the cast and the Olympic Mountains to the west. Elevation in the Port Townsend area ranges from sea level to 350 feet. Weather is mild because the city is sheltered by the "rain shadow" of the Olympic Mountains. Cost of living: Generally average, but food prices tend to be higher than in Seattle because of transportation costs. Average housing cost: $166,800 in Port Townsend in 1999, $184,000 in Jefferson County. Sales tax exemptions: Food items at grocery stores. Estate tax: None, except the state's 11 pick-up" portion of the federal tax, applicable to taxable estates above $675,000. 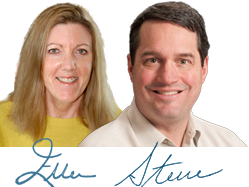 Property tax: The city tax rate is $ 14.45 per $ 1,000 of assessed valuation. The Jefferson County tax rate is $ 12.50 per $ 1,000 valuation. The tax on a $167,000 home in the city is about $ 2,4 13. Homestead exemption: Homeowners age 61 or older, with a gross household income of $28,000 or less, are eligible for certain property tax exemptions. Security: The FBI Uniform Crime Reports show a rate of 34.5 reported crimes per 1, 000 residents for Port Townsend in 1998. This is lower than the statewide rate of 57.2 and national rate of 46.2 reported crimes per 1,000 residents. However, state law enforcement officials point out that Port Townsend's crime statistics are incomplete. Religion: Several denominations are represented, with at least 30 places of worship in the Port Townsend/Olympic Peninsula region. Education: Port Townsend has a branch of Peninsula Community College, which has its headquarters in nearby Port Angeles. Washington State University has a branch campus in Port Hadlock, about six miles southeast of Port Townsend. Both offer programs for older adults. Transportation: Jefferson County International Airport is served by air-taxi operators with charter flights to Seattle, Washington's San Juan Islands, Vancouver and Victoria in neighboring British Columbia and other points. There is no scheduled air service to or from Port Townsend. Jefferson County Transit is an integrated system serving Jefferson, ClaIlam and Kitsap counties for transportation around the Olympic Peninsula. 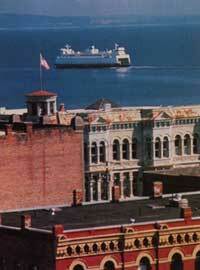 Within Port Townsend, there is free shuttle service between the port area and the city's historic districts. Washington State Ferries operates between Port Townsend and Keystone on Whidbey Island, with crossings taking about 35 minutes each way. The most direct way to reach Port Townsend from Seattle is to ride the Bainbridge Island ferry (Washington State Ferries) from downtown Seattle to Bainbridge Island, then take State Route 305 northwest about 13 miles, past Poulsbo, to State Route 3 and follow signs for seven miles to the Hood Canal Bridge. Cross the bridge and turn left. About one-half mile later, there is a sign pointing toward Port Townsend. About five miles after that, turn right on State Route 19. Continue about 22 miles to the town of Chimacum and a four-way stop on State Rouote 19. Route 19 joins State Route 20 about seven miles south of Port Townsend. Follow Route 20 into Port Townsend. The trip normally takes one and a half to two hours. Housing options: Popular with Port Townsend retirees are the Kala Point and Cape George neighborhoods. Kala Point, about five miles south of the city center, near the airport, has a mix of single-family dwellings, townhouses and time-share and for-sale condominiums. Amenities include beach access, walking trails, tennis courts and boat launching. Prices range from about $ 170,000 for a two-bedroom house to $1 million for a waterfront home with generous acreage. Three-bedroom condominiums are priced at about $300,000. Cape George, on Discovery Bay some eight miles west of Port Townsend, features beach access, a marina, swimming pool, community club, a workshop for hobbyists and views of the Olympic Mountains. Cape George is divided into three zones - first is The Colony, a residential area with single-family homes priced from about $ 200, 000 to $ 500, 000. A second zone, The Village, has less expensive properties, ranging from about $60,000 to $ 150, 000. Some modular and mobile homes are permitted in The Village. The third zone, The Highlands, is in forested property behind The Colony and The Village. Home prices in that zone range from about $150,000 to $300,000. Visitor lodging: Accommodations include hotels, motels and bed-and-breakfast inns. Options include the 33-room Port Townsend Inn downtown, with rates from $78 to S98 a night, double occupancy, (800) 216-4985. Bishop Victorian Hotel has 15 suites downtown, with rates from $99 to $200, (800) 824-4738. Blue Gull Inn, a five-room B&B in Port Townsend's historic district, has rates from $85 to $125 May to September, $75 to $110 the rest of the year, (888) 700-0205. Information: Port Townsend Chamber of Commerce and Visitor Information Center (Where to Retire magazine), 2437 E. Sims Way, Port Townsend, WA 98368, (360) 385-7869 or (360) 385-2722. On the Internet, visit www.ptguide.com.